A news package is a creative, visual, and long form of storytelling found on television newscasts. The news is conveyed to an audience by packaging together a story that includes characters, facts, plot twists, and a climax to provide entertainment value at the same time. These types of newscasts deliver in-depth coverage of news events by investigating subjects of all kinds. News correspondents probe trends, crimes, conflicts, and issues of interest to present long segments, and sometimes full one- or two-hour broadcasts, as news packages usually run for 1:15 to 2:00 in length. This type of news presentation is best for complicated stories or ones that have multiple interviews. In the case of magazine-style news programming, packages can be 20 minutes or longer. 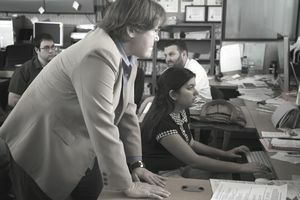 Reporters will often spend large amounts of their time researching stories and interviewing characters to eventually write the scripts for these packages. A common part of a news package is the appearance of a reporter talking into the camera. This is called a "standup" because the reporter is often seen standing in front of the camera on the scene of the story. Usually, the news anchor will read an introduction live, then the pre-recorded story will be shown. The writer has to consider both what the viewer sees (visuals) and also what they are going to hear (audio). There is the visual aspect of video production, where images and videos of the subject matter are presented, while the audio specifies sound bytes, voiceovers, and music that may accompany the visuals to help the story along. Timing and specific cues for the editor and post-production team are also important aspects of script creation for news packages. Indicating the timing and length of a particular visual on the script can help with weaving sound bytes and voiceovers together with images and storylines. By also indicating the tone and feelings that are to be conveyed, the emotional component of a newscast can start to take shape. Once the full package script is complete, the reporter is ready to go into a sound booth and record voice-overs. The post-production team will then use the script to bring together the whole news package, to create a newscast that is entertaining, compelling, and informative, while keeping in line with the reporter's overall vision and storyline.